Set in Oryol in the Oryol region, Apartment Marihotel Naugorskoe has a balcony. Guests are welcome to enjoy the free WiFi. Set in Oryol, Apartment On Naugorskoye Shosse features accommodation with free WiFi, seating area and a kitchen. Each unit is fully fitted with a washing machine, a satellite flat-screen TV, a sofa and desk. Boasting air-conditioned accommodation with a balcony, Квартира is located in Novotroitskiy. Guests may enjoy the free WiFi. Located in Oryol, Studio Open offers accommodation with free WiFi and access to a garden. Each unit is fully fitted with a washing machine, a flat-screen TV, a sofa bed and desk. Apartment Marihotel on Priborostroitelnaya is situated in Oryol. This apartment features accommodation with free WiFi. Situated in Oryol in the Oryol region, Apartamenty Na Priborostroilnoy 57 has a balcony. Guests may enjoy free WiFi. Offering free WiFi and city views, Apartments Crystal Club is an accommodation set in Oryol. Guests staying at this apartment have access to a fully equipped kitchen. Set in Oryol in the Oryol region, Apartment on Leskova 3 features a balcony. The apartment, set in a building dating from 2012, provides free WiFi. Boasting air-conditioned accommodation with a balcony, Apartment Marihotel Turgeneva is situated in Oryol. Guests are welcome to enjoy the free WiFi. 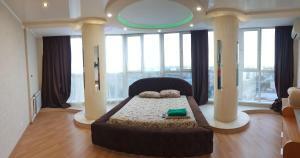 Offering free WiFi and city views, Apartamenty Na Priborostroitelnoy 10 is an accommodation set in Oryol. Guests staying at this apartment have access to a fully equipped kitchen and a balcony. Located in Oryol in the Oryol region, Apartment Marihotel Na Pobedy Boulevard has a balcony. The accommodation features free WiFi. Situated in central Oryol, this apartment features free WiFi and free public parking. Guests benefit from balcony with views of a green courtyard. 17 Ulitsa Saltykova-Shchedrina is situated in Oryol. Guests staying at this apartment have access to a fully equipped kitchen.